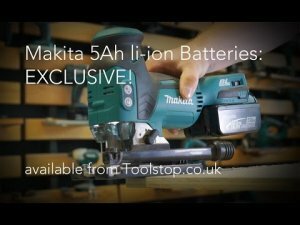 While here in the US Makita’s 4.0Ah Batteries (BL1840) are just becoming available, over in the UK and other parts of the world they will soon have access to the new Makita 5.0Ah batteries. ToolStop, a tool store in the UK, has a look at the new BL1850 batteries and clues us in on all the details. Obviously one would expect a longer runtime out of a 5.0Ah battery and in the video Makita UK gives us their numbers. Compared to a 3.0Ah battery, the 5.0Ah can deliver up to 66% more runtime per charge. As for charger time, how about only 45-minute on their newer DC18RC charger? And just as important, the size and the weight of the BL1850 is the same as both the BL1840 and the BL1830. Unfortunately all this info doesn’t tell us folks here in the US when the Makita 5.0Ah batteries will be available, but if you are in that much of a hurry you could always buy overseas and have them shipped over. I am sure ToolStop would be happy to have your business, once they are available. Until then the BL1840’s are calling BUY – Amazon, though it might be a better value to buy the new Makita XPH07M which comes with two 4.0Ah batteries. http://www.toolstop.co.uk/?q=makita+5ah - CLICK for the range of Makita tools supplied with 5Ah we stock. Makita's new 5Ah 18v LXT battery packs promise up to 66% more rumtime over 3Ah packs, plus they're the same weight and size as previous batteries. And they'll charge in only 45 minutes!